To achieve this, the company used Epiroc rig mounted heavy hydraulic breakers equipped with Epiroc's patented Intelligent Protection System (IPS). The widening of the A27 and A1 motorways between Eemnes and Bunschoten-Spakenburg is a huge infrastructure project. On the Utrecht to Almere stretch of the A27 alone it involves the heavy demolition of six aging viaducts and their foundations. 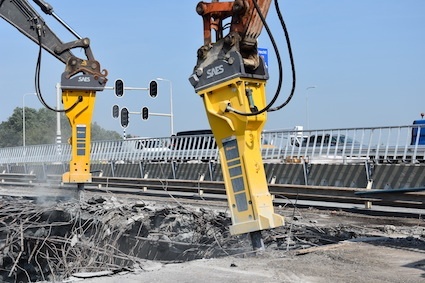 To minimise traffic disruption, the contractor was given a window of 48h during the weekend of 26-27 May to demolish three of the old bridges located near Hilversum and Bilthoven, an urban area with restrictions on noise and dust creation. Each bridge was 150m long and 6m high, and altogether the demolition work involved breaking 5,000m3 of specially reinforced concrete. The job was completed successfully within the timeframe using nine Epiroc rig mounted heavy hydraulic breakers with service weights of three to seven tons. These comprised of four HB 7000's, an HB 5800, three HB 4100/4200's, and an HB 3100. The machines were mounted on Volvo, Cat and Hitachi carriers. Site manager Maarten Lek, stated that efficient service for the hydraulic breakers, as well as spare machines, and was provided on site by Epiroc distributor SAES International BV. 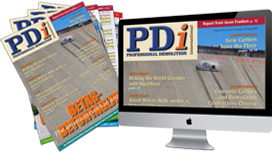 Epiroc heavy hydraulic breakers feature the patented Intelligent Protection System (IPS), which combines Epiroc’s popular AutoControl and StartSelect functions, and automatically adapts the breaker’s operating behaviour to any working condition. IPS permits more accurate and significantly faster positioning of the hydraulic breaker, thanks to the centring effect, and avoids blank firing that often results in tool damage. Uptime is higher since with IPS no operator intervention is required and thus there is no interruption of the working process.